The Metrolinx Board met on February 17 with the following items, among others, on their public agenda. Updated: Replies from Metrolinx to questions clarifying their process for grade separation prioritization have been added to this article. There are now close to 6,000 readers installed on TTC vehicles and in stations. In January 2017, total trips paid for with Presto crested 4.5 million, and during the past week (second week of February), there were 1.2 million Presto fares paid on the TTC. Over half of these fares are paid in subway stations. Across the province, Presto collected over 5 million fares. These numbers are impressive to the untutored, but omit the fact that this is a trivial proportion of the total fare transactions on the TTC which has close to two million daily riders, and double the volume of “boardings” when transfers between vehicles are counted. This is offset by barrier-free transfers between routes at subway stations that, at least for the present, do not require one to “tap” just to change vehicles. 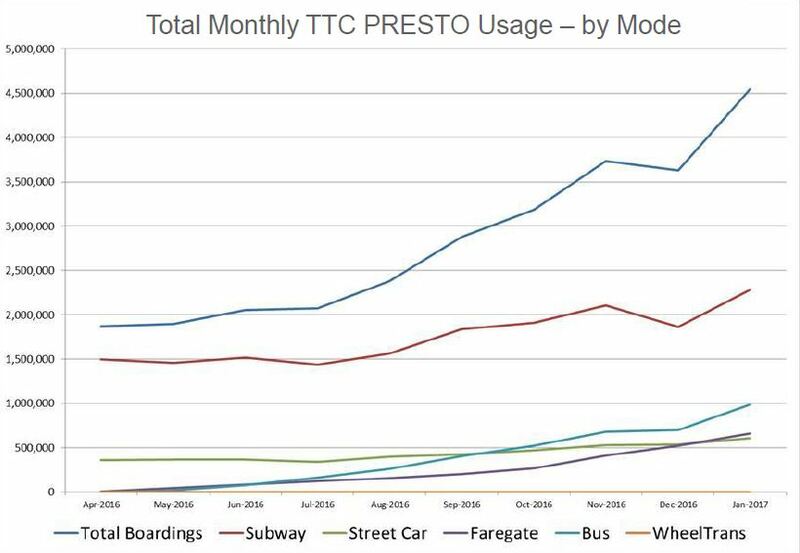 Presto usage is growing, but the most important changes have been to software on Presto devices. Problems with reload machines should be corrected by new software, and reliability stats have improved according to Metrolinx. The fare vending machines will be replaced beginning late in 2017 when new devices will be installed in subway stations. These will vend all fare types including the new Presto single ride tickets. This conversion is essential for opening the subway extension to Vaughan where the stations were built without the traditional collector’s booths and fare vending procedures. Entry will only be via Presto, according to Metrolinx. On surface vehicles, there has been a problem with the operating system on the readers (it is a now unsupported version of Windows CE). Upgrades are in progress, and I can report from personal observation that out-of-service devices have been less common in the past week. Whether this is an accident of my travels, or a real improvement, we will see in time. Metrolinx has devised a new scheme to determine when readers in the field are not working. Using a combination of reader data, cell phone records (the devices “phone home” for updates) and Nextbus tracking data, Metrolinx can distinguish between units that have failed in service and those that are sitting in out-of-service vehicles in garages. Current reliability stats are at 95%, but Metrolinx is holding off on publishing details until there is enough data available to justify claims of improvement. Metropass functionality will come soon to Presto. This had been held back pending software updates last fall (not to mention increased capacity in the backend data centre). The intent is to gradually phase in passes on Presto cards to avoid a “big bang” effect and the problems of a fast rollout. About one third of payments (reloads) are now handled online, but Metrolinx is hoping to encourage a higher proportion. (This number appears to be low, but could be due to dilution of the original GO Transit user community by more-recent Presto converts on the TTC.) A mobile point-of-sale device will be used at retail locations where riders will be able to reload their Presto cards. The participating retailer has not yet been announced. Meanwhile, Presto cards are available at Gateway News outlets, albeit with surcharges by the vendors who are all “independent” and free to charge whatever fees they desire. This is a bizarre situation that could have been avoided if sales had been handled by TTC collectors pending the installation of robust, high volume vending equipment for fare media. A mobile “Presto App” will be introduced concurrently with Open Payments and support for Apple Pay in late 2017 or early 2018. A major shift will come with a move away from processing logic shared between Presto cards and readers to “backend” system processing much like online banking. This will give move flexibility in the payment products that Presto can handle because it will no longer be tied to a proprietary card. This capability is in place now and is under testing. All of this is presented as “good news”, but one must ask why most of the Presto equipment failed to operate properly and/or was poorly designed from the outset. After unacceptable rates of [on board vehicle reader] failures were seen in the fall multiple software updates have been applied to all PRESTO bus and streetcar readers. This was clearly a system not “ready for prime time” even though it was touted, nay, forced on transit systems as Ontario’s fare collection solution. Metrolinx staff acknowledge that other systems such as Oyster are years ahead, but this begs the question of whether licensing existing technology would have been preferable to a roll-your-own system. There are historical reasons behind some of Presto’s oddities (the state of mobile communication networks in early days being one), but these are far in the past. With a move to Open Payments and a shift to central processing of transactions, Presto will be less a proprietary technology than a brand name. This should leave Metrolinx free to concentrate on service and convenience rather than technology development, a field where the Ontario government’s record is less than stellar. Meanwhile, negotiations with client cities continues regarding renewal of Presto operating agreements and fees, a topic that has raised considerable objection as Presto looks to increase its revenue stream. There is a certain bait-and-switch aspect to Presto and its move to be self-sufficient after years of government subsidy. Metrolinx has undertaken a review of all of its level crossings which number 185 on the public portion of its network, and a further 51 on private properties such as farms and industrial sites. Of the 185, 46 are on the portion of the network that is not owned by Metrolinx, but by the freight railways. As the frequent, all day service builds out on the network, more and more crossings will reach a point where the combination of train frequency, competing traffic volumes and site conditions dictate that crossings must be grade-separated for safe and reliable train operation. The crossings were all ranked based on an Exposure Index combining these factors, and staff recommended that the Board approve a list of sites for inclusion in work on the RER (Regional Express Rail) infrastructure projects. Items marked (*) below were announced in 2015, and for them planning and design is already underway. Beyond this immediate approval, Metrolinx is working on a review of all of its crossings which they hope to complete in draft by September 2017 with a final version by December. Full details of the methodology and scoring for each crossing are in the report. This totals 115 crossings. The remaining 70 have Exposure Index values below 200,000 which Metrolinx cites as an industry standard for the point below which grade separation would not be require. The first round of grade separations selected by Metrolinx comes from the first tier, locations that they own and that will have service every 15 minutes or better. Metrolinx policy is that they will not create new grade crossings anywhere, but there will be cases where either by acquiring new corridors or by service improvements, the ranking of sites for grade separation will change. It is unclear whether there are aspects of the Exposure Index that would trigger a widespread need for more separations, although an obvious issue would be service frequency. At some point, trains will arrive too frequently, considering bidirectional service, for the intersecting road and its traffic. This has implications in future decades of RER if the base frequency drops below 15 minutes, not to mention the potential traffic effects at stations where both development and passenger volumes would grow. Metrolinx standard is that all crossings have at least warning lights, bells and gates, and this would apply both to existing locations and to any which are added through network expansion. Costs are shared with the affected municipality, and where Metrolinx initiates the project, the federally-mandated split is 85/15 with Metrolinx bearing the lion’s share. The proportion can change, as it did in some Toronto projects, if other municipal works or improvements are combined with the grade separation. Metrolinx acknowledges that determining these costs up front is an important part of engaging municipalities in these projects. Q1. In his presentation, Greg Percy stated that GO’s policy was that no new level crossings will be created. Does this implies that any further expansion of service (at least on GO-owned corridors) would not be undertaken without removing the level crossings? How will this policy affect any future expansion plans, especially for new services on a limited (peak only) basis? Or does the policy simply mean that GO will not agree to any new level crossings where one does not already exist? A1. The policy is for any future crossings where one does not already exist. The Metrolinx policy is that it will not initiate any new level crossings on its network, or support any proposals by others for new level crossings. Q2. Current plans are for RER service to operate every 15 minutes in most corridors. Is the structure of the index such that there is some critical level where the service frequency is high enough (every 10 minutes? 5 minutes?) that all other factors have little bearing and full separation is required? In other words, is there a constraint on how much more frequently service can be provided before a requirement to grade separate every crossing comes into play? A2. There is no specific level of traffic at which a grade separation is required. In developing the analysis, combined rail and road traffic volumes were incorporated along with other factors such as accident history, the surrounding environment, the physical geography and construction considerations. As traffic increases, the option can be considered along with other measures such as enhanced crossing protection, signage and sight line improvements. In a separate series of articles (beginning here), I have reviewed this update and related work from June 2016. The supposed purpose of this round is simply to introduce a fourth possible scheme to the consideration, a fully fare-by-distance model. Not to belabour a point, the problem lies in the aspects of fare structure that Metrolinx chooses to ignore, and the lack of published modelling of the effects a new fare structure will have. To put this in context, according to the January 2017 GO Fact Sheet there were 304,000 “boardings” (one passenger boarding one vehicle). Given that most feeders to GO’s rail operations are not operated by GO itself, we can assume that the ratio of “boardings” to riders is not much above 2:1. (Most riders will make a round trip and hence count for at least two boardings, but their “last mile” journey will be by private car or local transit bus. Therefore, this link will not count as a GO Transit boarding.) This gets the number of daily riders down to somewhere in the 150k range, possibly lower. And so for GO, those cross-border trips represent about 1/3 of their rider base. However, the TTC carries about 1.8 million rides per day, which translates to many more boardings (the average TTC rider transfers once per trip), and many more individual riders than on the GO system. Cross-border fares are annoying, but they affect a minority of TTC riders. That is not to say they should be left as-is, but any change should not come at the expense of higher fares to most TTC riders who would not benefit from a cross-border discount. In other words, Metrolinx is still hung up on revenue neutrality, and hopes somehow that costs for riders will not change. Both goals are simply not possible. A study from June 2016 has already established that a new fare scheme will incur a net cost because new discounts offered to one set of riders will not be offset by added fare revenue. As for keeping commuting costs to “no more than they are today”, that is applicable only to all riders, and there will both winners and losers as the fare revenue shuffles around. By June, Metrolinx expects to have enough information for a round of “engagement” on a decision with the municipalities. Just how subtle those discussions will be and which options will be offered remains to be seen. In particular, a fait accompli with a single, predetermined fare structure and philosophy is not “engagement”. The last thing municipalities need to hear is that a single scheme has already been recommended to and approved by the Metrolinx Board. Conversations with the regional Mayors and Chairs to date have been on an individual basis, not as a group, and the dynamics are quite different. As one Metrolinx director observed, “the devil is in the dollars”, and with the bulk of trips taking place inside of Toronto, there is a political problem. Raising fares on 90% of riders for the benefit of 10% simply won’t fly. However, there is a related problem with Mayor Tory whose SmartTrack scheme requires some sort of fare integration, and his willingness to rock the boat on a Metrolinx proposal may be compromised by a desire to advance his pet project. Another director noted that a proposed fare-by-distance framework could appear good, but tap on/off requirements could clog up transit operations. This type of requirement is not unknown internationally, but Presto as implemented (especially on the TTC) is not oriented to serve “tap offs” well. Indeed we have yet to see how it will work with only the full volume of “tap on” traffic. Aside from system capacity issues, there will almost certainly be a need for more readers on vehicles (both for volume and facing appropriately for both boarding and alighting passengers), and changes in subway stations to deal with the very large volume of riders who now make barrier-free surface to subway connections. The implications have not been thought through, at least not publicly. One director asked whether there are warning signs on political issues that might arise. Metrolinx staff replied that operators (the various transit systems) “all agree” that the fare by distance scheme is useful and helpful, but without specifics it is hard to know just what they have “agreed” to. Moreover, that opinion is at a staff level and does not necessarily reflect what will happen when the implications reach the politicians. Director Carl Zehr, a former Mayor of Kitchener, asked about integration with municipalities beyond the 905, and worried that local systems would be forced into adopting Presto. It is clear that this system is still not universally welcomed, or at least trusted. An intriguing thread emerged from Leslie Woo, Metrolinx Chief Planning Officer, who noted that a metric of social benefits (a common part of benefits analyses for capital projects) needs to be part of the discussion. Metrolinx undertakes very large capital projects that bring ongoing financing and operating expenses that are simply part of the cost of doing business. Meanwhile, fare subsidies to address implementation of a new fare structure and limit its negative effects could have a higher payback as an “investment”. She hopes to present an update to the Board incorporating this view in June 2017. The challenge, of course, will be to get political buy-in. If Metrolinx had started with that outlook rather than seeking some sort of revenue neutral scheme that inevitably would penalize some riders, this whole process and debate could have been much simpler over a year ago. CEO Bruce McCuaig claimed that, at present, there is no “front runner” among the possible fare systems, and that there is a lot of work still to do. In the short term, a proposal may take elements of the options under review. Chair Rob Prichard noted that the purpose of this report was simply to get Option 4, full fare by distance, on the table for consideration. The sound of an organization tip-toeing back from a potentially contentious position is unmistakable. Following the meeting, I posed questions of Metrolinx about their studies. The following is from an email reply of February 21, 2017. Q1. Are there any additional studies including any related to the newly proposed Option 4 (fare by distance) before the Board today? A1. There is no additional documentation being published at this time. a. What additional configurations have been studied, e.g. higher or lower differences between fare classes? Each of the four concepts being analysed could have a near-infinite number of permutations. A fare structure’s overall performance can be affected by factors such as the absolute prices charged, relative pricing differences between service types, definitions of service types, transfer/stopover policy, and a whole variety of choices related to how distance travelled gets reflected in the fare. Those would include the size and layout of any fare zones, the shape of a fare-by-distance curve (i.e. its slope and whether flat sections or inflection points are included) and the exact method for calculating distance, to name a few. 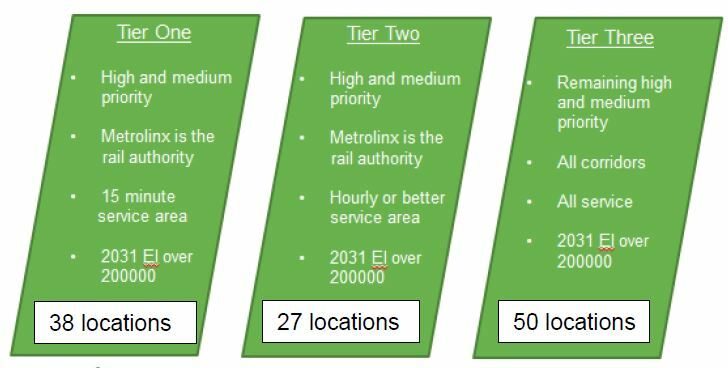 During this initial analysis phase, Metrolinx and its consultant have created and tested hundreds of different variants in order to estimate the range of possible performance by all four concepts and identify common themes in terms of opportunities and limitations. It is important to bear in mind that considerations beyond the structure, such as what products are offered, further impact performance. b. The study concentrates on the effect of a new fare structure on cross-boundary travel. Has the effect on riders within Toronto been studied considering that the distances associated with various fare tiers been calculated and detailed? While to date most of the public conversation has been about fare barriers associated with cross-boundary travel, the study is taking a holistic view of the regional transit network and is concerned with trips of all types. The way a fare structure handles the large number of trips that are internal to the City of Toronto (including both those that are on the TTC only, and those that already involve GO or could theoretically involve GO) is of tremendous importance and will be carefully considered as we continue to advance analysis. Considering the amount of consultation that has already taken place at the political and staff level, and the claim that a recommendation will likely be made in June 2017, the analysis should be sufficiently advanced to give both a general picture of the effect of various fare schemes if only to make sense of these consultations. It is self-evident that there are hundreds of permutations and effects, but the interaction of these should be reasonably well understood by now. We should not arrive at a recommendation cast in stone, one that will automatically receive the weight, such as that might be, of “board approval” without a better understanding of the options. It is ironic that other parts of Metrolinx have learned the hard way that simply dropping a solution into the public realm is a recipe for disaster, and that it undermines Metrolinx’ reputation. The Fare Integration Study appears to be headed straight for the same type of blunder. The issues surrounding the lawsuit between Metrolinx and Bombardier has been covered in the press in some detail, and I am not going to attempt to summarize the positions of the two parties here. In brief, Metrolinx has served notice to Bombardier that it wishes to cancel its vehicle contract for non-performance, and Bombardier has sued claiming that Metrolinx has misrepresented the state and history of its order. Only 76 cars are required for Eglinton-Crosstown and 23 for Finch. The status of eastern and western extensions of the Crosstown to University of Toronto Scarborough Campus and to Pearson Airport is dubious given rising costs of competing transit projects. The Sheppard East LRT, although still mentioned in recent government economic statements, is under heavy fire from the Scarborough Liberal Caucus who are pushing for an east-west subway extension, not an LRT. Some of the Metrolinx cars will go to the Mississauga and Hamilton LRT projects, if these ever get off the ground into construction. When a car is accepted, the clock starts ticking on the warranty (which is paid for as part of the purchase). It is conceivable that if cars were delivered now, they would be out of warranty well before the lines for which they were bought entered service. Bombardier’s position is hardly angelic. Their deliveries for Toronto are well behind schedule, and without a major reorganization of their production facilities to repatriate work from Mexico to Canada, it is doubtful Toronto would ever see its new fleet. Even though the first car for the Kitchener-Waterloo ION LRT line has been shipped, much work remains on it although the extent of this has not been published. What is even more appalling is that this company is supposed to be a Canadian success story, and it has built hundreds of vehicles for Toronto and other North American clients in years past. The European operation churns out new cars similar to those ordered by Metrolinx for many cities. Meanwhile, the company’s owners appear more interested in building airplanes and soliciting government subsidies. Management turnover at the Canadian rail operations is distressingly high leading to concerns about management frustration and project continuity. Metrolinx public statements have been unusually forceful considering the charmed life Bombardier leads in political circles, but the details of both sides’ claims will not come out until the court case begins in a few weeks. This entry was posted in Fares & Fare Collection, GO Transit, LRT Projects, Transit. Bookmark the permalink. Any study of electric buses may not start until after 2020, when there should be enough diesel buses left over after the opening of the Eglinton Crosstown LRT. Steve: You’re in the wrong meeting. That’s the TTC meeting, which I have not written up yet. Thanks for all this great analysis and work! I don’t get where Metrolinx think paying two fares to cross into the 905/416 is a barrier, most users can buy a GTA pass. Metrolinx [could] lower the cost of the pass by subsidizing the agencies. Also, as someone who crosses the boundary to get to work, I would prefer to use the TTC/GO Bus to get to my job in the SQ1 area. Problem is, that combo will cost me over $20 round trip, compared to $6 via TTC/Miway. If Metrolinx was so concerned about cross boundary trips, why don’t they look at making access to GO transit cheaper? Steve: Because Metrolinx (Queen’s Park) does not want to spend any more money. They prefer to let everyone else pay so the Minister can get a photo op announcing lower fares. Fare integration is not rocket science. If Metrolinx sets up a co-fare system for the TTC, a lot of the problems (not all) will be mitigated. Most cross border trips involve GO Transit in some way. For example, Durham Transit -> GO Transit -> Mississauga Transit. This is due to speed. It will be a long time to go from U of T Scarborough to Oshawa Center using Pulse. It will probably be faster to take the 38 bus to Rouge Hill GO, switch to the Lakeshore East train and then connect at Oshawa GO station. No one will object to a co-fare if it costs less than a dollar. Using Presto, the GO portion of the trip will be $7.55. At Oshawa GO, the co-fare on the DRT will cost $0.75. Assuming the TTC co-fare is the same. The trip will cost $9.05. Technically, one DRT fare is needed to go from UTSC to Oshawa Center. However, using GO Transit will be faster. Transit is about speed and not just price alone. If the TTC co-fare is not in place, it will be $11.30. By having the co-fare, it will be easier to set up on the backend since the existing TTC fare structure can remain in place. If there is no Canadian content requirements, it is very easy to ship trams to Canada from Germany. The Flexity trams are modular, so aside from TTC specific parts, it is very easy for other production sites to step in without retooling. We are not talking about taking an Airbus factory and converting it to a tram factory. With the low EUR exchange rates, sourcing them from Europe might end up cheaper. Bombardier is not in the best of shape right now. For 2017, there has not been one new order for the CSeries. If there are no new orders to take the order book past 500 firm orders, it will be hard to have an enhanced version later. Operators like to buy into a familiar airframes with continuous improvement. This way, they do not have to retrain crews when new improvements are made. The CSeries is an airframe that should last several decades with continuous improvements. Without 500 firm orders, it risks being an orphan. Airbus and Boeing are not doing well either. Many airliners are delaying deliveries. Bombardier needs to secure an order from IAG Airlines Group soon. This will be an established airlines ordering the CSeries much like Delta Airlines and Air Canada. Since aerospace products generate more margins, a successful Bombardier Transportation requires a successful Bombardier Aerospace. The reason why Bombardier Transportation is a success story is due to research at the aerospace division. For example, thinner walls of the T35A08 came from aerospace research. The cabin pressurization technology used in the Qinghai–Tibet railway also came from Bombardier Aerospace. It allows a train to operate at the world’s highest elevation. Before Metrolinx does any grade separations on the Smart Track, they ought to think about the station design as well. At Smart Track Finch East station, it will not be a simple station like Lincolnville GO. It will need to allow for TTC bus connections and possibly bus bays depending on what routes are connecting to it. Look at Agincourt GO today, it is a terrible place to connect to TTC buses. For Smart Track to be successful, it needs to have proper station design so that a bus to Smart Track train connection is smooth and seamless. It means not walking 500ft in the open. Steve: There are some preliminary designs, notably for Finch East, although they come with the usual generous parking lot that contributes almost nothing to overall demand for an all-day service, but keeps Metrolinx folks who think of the “last mile” as a car trip happy. See this city report, notably at page 18 for Finch. 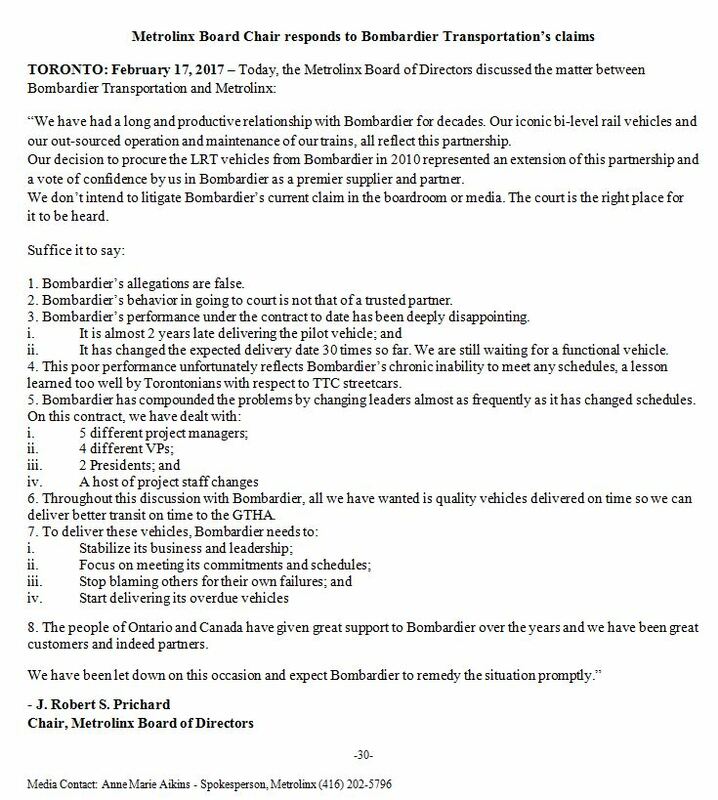 Bombardier’s attitude is extremely annoying and hypocritical. They have repeatedly changed the TTC delivery dates and are more than a year late with Ion, yet they have the gall to pocket our tax dollars and blame Metrolinx for attempting to protect itself from more of the same. Metrolinx said: There is no specific level of traffic at which a grade separation is required. They either didn’t know the answer or misunderstood the question. Their “level of traffic” is for road traffic, not rail traffic. Obviously, there is a critical balance between rail service levels and available through-put for a grade-crossing. The issue is if the grade-crossing would then be closed or grade separated. Specifically, a single GO train operating at 60mph will occupy a grade-crossing for a minimum of 52 seconds (30 second warning, 12 second passing, 10 second bar clearing). Assuming the worse-case scenario, a train from the opposite direction would then be 800m from the crossing to begin the cycle again. This would be something like two minute headways (allow 12 seconds for car acceleration and travel) as the lower barrier to permit road traffic. Thus, you can calculate the maximum level of traffic a grade-crossing can support for a given headway. Steve: And those timings would obviously change for lower speeds such as near stations with passing times going up. On the road traffic side of things, there is the issue of how much capacity is actually needed and how routine blockages at crossings would affect traffic in the nearby network. Children’s fares do work. I got a Presto Card for my daughter from a GO station. It opens the gates at TTC subway stations and records a $0.00 fare charge. The Metrolinx-Bombardier spat continues. I am glad that Metrolinx intends to cancel the LRV/LRT contract from this extremely incompetent company (i.e. Bombardier). Not only has Bombardier delayed the streetcar contract, it has also delayed the opening of the LRT project in Kitchener/Waterloo. The subway trains that Bombardier has delivered continues to have door problems to this day. I have been in many subway trains taken out of service due to door issues and then the next one is too crowded for everyone to board. The new streetcars have a very high failure rate with screws, etc falling down from day one. The prototype vehicle that Metrolinx had for its media photo-op a few days ago in Kingston does NOT work. I don’t understand why the TTC continues to buy subway cars from Bombardier when they can’t even get the doors to work. Bombardier could not even deliver a single streetcar from Dec of last year to Feb of this year. Metrolinx should also cancel it’s contract for more GO train coaches from Bombardier. I hope that Waterloo Region will also cancel its contract with Bombardier. There are many other suppliers who are more competent. doconnor: Children’s fares do work. I got a Presto Card for my daughter from a GO station. It opens the gates at TTC subway stations and records a $0.00 fare charge. Are you lying because child Presto cards don’t exist? Or did you just buy a regular one and then register it for your daughter? Steve: That’s what he was saying. Clearly the Presto system already knows how to deal with a card registered to a child already. It has to because “child” discounts are part of GO Transit’s fare structure. If TTC and Metrolinx were to cancel their LRT orders it would add at least 2 to 3 years to the start dates as new cars would need to be ordered,tested and delivered. It would also add to the costs but they might, just might, be able to sue Bombardier to recover some of the extra costs. The Flexity cars are running all over Europe with no problems. There seems to be a problem here because Bombardier out sourced some of the parts to a Mexican subsidiary which were not up to spec and the TTC correctly refused them. I believe that the threat of cancellation is part of an negotiating plan be Metrolinx to get some type of compensation from Bombardier. Waterloo cannot cancel because they need the cars for the end of the year and there is no way they could get get them in time unless they took them from an existing order from some one else. I think your calling doconnor a liar is harsh. He never said he got a child’s Presto card but a Presto Card for his daughter. I have a Senior’s Presto card which is a standard Presto card that charges me a senior’s fare. You can also set up the card for a child or a student’s fare. I think that the tone light combo is different for regular and concession fares. Steve: Yes, for concession fares you get a yellow-green light and a two-tone sound. Me/James: The subway trains that Bombardier has delivered CONTINUE to have door problems to this day. I think that if one (i.e. Bombardier) still can’t get the doors to work after a decade, then they (i.e. Bombardier) should be forbidden from doing any kind of business in Canada PERIOD. Steve: The “door problems” relate to the cab doors, not to the passenger doors. There is an interlock on the cab door (the one to the platform) that prevents the train from moving when it is open. That’s where the issue is. Still, this is pretty basic stuff. Robert Wightman: I think your calling doconnor a liar is harsh. I never called doconnor a liar but merely asked if he was lying. I think that ‘lying’ may have been the wrong choice of a word (I should have substituted ‘joking’/’kidding’ for it). In particular, I NEVER stated that he was using a child Presto card as he clearly stated that it was for his daughter. I apologise if I may have offended doconnor or anyone else. James wrote: I hope that Waterloo Region will also cancel its contract with Bombardier. A better way to stick it to Bombardier would be for Waterloo Region to NOT cancel their contract if Metrolinx does. Waterloo Region chose to piggy back on the Metrolinx order in order to get a better price that an expensive bid process would have gotten them for 14 LRVs. Even if Metrolinx now cancels their order, Bombardier has to deliver 14 LRVs for the large quantity price that is in their contract. Imagine purchasing something that gives you a price break for buying 500 pieces, but then returning 400 so you end up with 100 pieces for the 500 price? That is effectively what would happen if Metrolinx cancels and Waterloo Region does not. Steve wrote: Clearly the Presto system already knows how to deal with a card registered to a child already. It has to because “child” discounts are part of GO Transit’s fare structure. As I have mentioned in other threads, if a Presto card is registered as a concession fare (child, student, senior) through one agency, the CARD gets that status and the user of that card gets that concession’s price (if there is one) on ANY agency’s system. All that is needed is for there to be a concession price for a given system. From personal experience, when my youngest was still in high school (5 years ago), the Presto card was registered as “student” (which had to be re-done every year, as it automatically expires the end of August) through YRT’s office. Use of the card on GO got student fare. Use on the TTC, who at the time only had readers at a few subway stations and no concessions defined for Presto, charged the token price. Use on DRT, who at the time only had the ride-to-go co-fare implemented with no concessions, would initially charge the adult ticket price when boarding, then the GO fare would be credited with the difference between that charge and the co-fare charge. Asking someone if they are lying is really the same as asking them if they are a liar. I think you should think twice before doing that again. No one ever stated that you said doconnor was using a child Presto card for himself. That is a non sequitur in this conversation. Relax Steve: this is my last comment on this topic.